One difference between martial arts styles developed in Asia and many of the Western arts is the refinement of the legs and feet as striking weapons. In Shotokan karate in particular, kicking techniques, or keri are seamlessly integrated into the curriculum and are one of the six major classes of techniques (zuki, uke, uchi, nage, keri, and dachi). Keri does have some advantages compared with techniques executed with the arms. Specifically, they have a longer reach since the legs are longer than the arms and they are generally more powerful, since the legs contain more muscle mass compared to the arms. Finally, in self-defense situations, the attacker can be surprised by the use of the legs in combat. Along with these advantages, there are also some drawbacks. First, the balance is diminished since the body is only supported on one leg. Additionally, kicks can be slower and less coordinated than arm techniques, since the legs are not used for fine movement, as are the arms and hands. In Shotokan, kicking techniques are practiced above the head (similar to tae kwon do). This is contrary to many Okinawan karate and grounded Chinese styles of martial arts that do not kick above the waist. The argument for low kicks is made in terms of minimizing the time the kicker is standing on a single leg and reducing the chance that the kicking leg may be grabbed. However, in Shotokan, high kicks are used as a training aid to develop legs and muscles that connect to the hip. Similarly, the lower straddle-leg stances are training aids for the much looser free kamae stances. The Japanese term for kick is keri, but when another word is used to specify the type of kick, keri becomes geri. So a front kick is mae geri. The word geri alone, however, means diarrhea. Japanese is an interesting language. The first major teaching point for kicking is the preparative knee lift. It is vital that the leg be quickly drawn high and tight and that the femur be at least parallel to the floor. This allows the correct path of the limb to the target with minimal torque to the knee. In addition, it is important that the extending limb retract along the same path back to the initial load position. The second major point in kicking is to closely monitor the path of the kick. The path should be effortless and allow correct movement through the hip joints of both legs and correct extension of the knee joint. There should be no lateral movement. The leg should extend and retract naturally along the same path. To achieve this, it is important to practice the kick slowly and in a controlled fashion. This will help develop the correct stabilizing muscles as well as reinforce the correct neuromuscular pathways to fire the muscles in the correct sequence. The third major point is to pay very close attention to the supporting leg. At least half the drive of the kick is derived from this leg, since it is in direct contact with the ground and should (as in almost any technique) contribute a significant portion of the forward drive. It must be rotated or set into the correct position to provide the maximal drive, from floor to hip, and be precisely timed with the impact. The position of the supporting leg will vary according to the direction of the kick and the type of kick, whether keage or kekomi. The fourth major point is to make sure the correct weapon is exposed to the target and at the correct angle. If the wrong weapon hits, not only could the kick be ineffectual or off balance, it may indicate that the path and final position of the kick is incorrect. One example is in the side snap kick (see below), where the hip must be turned over enough so that the leg correctly rotates in the hip. Otherwise, the impact will be taken on the little toe rather than on the blade of the foot. The fifth major point is to avoid hyperextending the leg. Keep the joints soft; that is, make sure the joints are not hyperextended at the full extension of the kick. Repeated jarring through hyperextension of the kick will inevitably lead to injury. Finally, it is important to develop flexibility and only kick within the limits of your flexibility. Flexibility in this context does not mean how high the leg can be swung, but rather how high the leg can be lifted with control. It is this balance of strength and flexibility that will allow the correct mix of body alignment and force for the impact of the kick while keeping the kicker injury free. 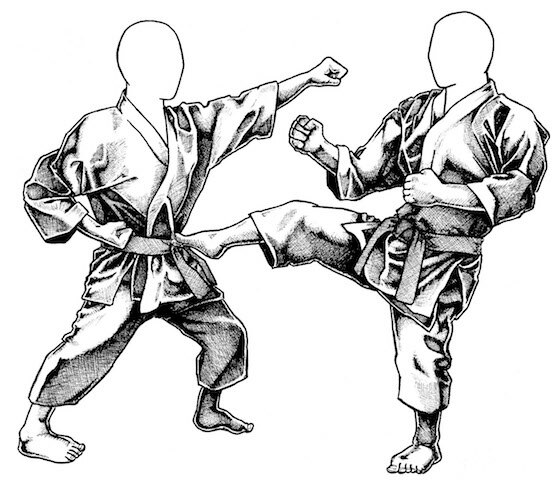 Kicks in karate can be divided into four major classes, from which all kicks can then be derived. The first class are the mae or front kicks, the second are the yoko or side kicks; the third are the mawashi or turning kicks (sometime also called roundhouse kicks), and the last are the ushiro or back kicks. Front kicks take a vector from the front of the body straight to the opponent, as if you were pointing directly ahead. The front kick, mae geri, moves in a direct diagonal line from the floor to the target. It can be performed from either the front or back leg and may be either keage (snap) or kekomi (thrust). Key points for the kick are to lift the leg high and tight in the preparatory position, and during the retraction to bring the ankle as close to the buttocks as possible. The foot is pulled back at the ankle (dorsiflexion), with the toes also pulled back. The leg then extends toward the target, and the foot is extended (plantar flexion) and the toes are pulled back so that the ball of the foot makes contact with the target. Note that the ankle goes from dorsiflexion to plantar flexion during the extension of the leg (basically, the foot is kept level as it moves toward the target). The trajectory of the ankle and foot to the target is a straight line. This can be demonstrated by stretching a belt or obi from the heel of the back foot (kicking leg) to the target; as the leg moves, the ankle moves along this line. The hips at the point of contact contract slightly upward and are in the shomen position. The hips at the beginning may be in either hanmi or shomen. If they start in hanmi, then they rotate and tuck; if in shomen, they just tuck. The support leg drives into the technique and has the effect of pushing the body center into the target. As with all techniques, the drive of the hip through the grounded leg must be timed to the impact of the technique. That is, the hip must still be in motion toward the target as the foot hits the target, otherwise only the weight of the kicking leg will be transferred to the target, as compared to the entire body. Side kicks, or yoko geri, are generally performed with the opponent to the side. The striking surface is the blade or side edge of the foot. To achieve this position, the foot is dorsiflexed toward the shin and the toes are pulled inward. The foot is rotated laterally to a plantar-flex position, exposing the blade of the foot. The roundhouse (or turning) kick gets its name from its characteristic motion, which is horizontal to the floor. It is designed to kick around opponents and hit them from the side. Mawashi geri, the roundhouse kick, could be called a sideways front kick. The preparatory position has the kicking leg high and tight to the back (my pet name for this kick is "dog taking a pee kick" for this reason), the shin parallel to the floor, the foot dorsiflexed, and the femur in a straight line from the knee to the opposite hip. This position is maintained as the hips are rotated, and the supporting leg drives toward the opponent; this is achieved by rotating the supporting leg so that the foot is pointing away from the opponent, as in yoko geri kekomi. This has the effect of driving the body center toward the target. The kicking leg simultaneously extends toward the opponent as the body rotates in an arc. Ideally, impact is made at the same time as the heel of the supporting foot connects with the floor after its rotation. If done correctly, the shin bone of the kicking leg runs out on a smooth arc that is parallel to the floor, giving the illusion that the shin "telescopes" from the knee joint. The kicking weapon can be either the ball of the foot or the instep. To kick high, the hip must be opened wider in the load so that the femur is open and the whole femur and shank point to the target. It is not sufficient to simply point the knee toward the target. The shin in its arc must always remain equidistant from the floor. Back kicks are the most powerful class of kicks in karate. They derive their power from the buttocks and using the heel as a striking surface. Ushiro geri, or back kick, is very similar to what a horse does when someone walks behind it. To execute the kick, the knee is lifted as in mae geri, and the leg then drives straight backward, brushing the knee of the support leg. At the point of contact, the back flexes, and the foot is pointing downward. The striking surface is the heel. While there are many other variations of kicks—hooking, spinning, and jumping—it is important to practice the basic five kicks: mae geri, yoko geri keage, yoko geri kekomi, mawashi geri, and ushiro geri. If these kicks are practiced consistently, it becomes obvious that they supply the mechanics for all other kicks. Therefore, it could be argued that all other kicks simply derive from these basic five.